by Sister Catherine Madigan, D.C.
"Karibu, Kenya" means "Welcome to Kenya!" It all started with an invitation from the Vincentian priests in Nairobi who wanted the Daughters of Charity to come serve the Kenyan people. After going through proper channels, some Daughters came to explore the possibility of a mission in Kenya. In a short time, the Archbishop of Nairobi and the Bishop of Kitale diocese welcomed Sisters to come and work in their jurisdictions. With their approval and that of the Major Superiors of the Daughters, this became an international call to the worldwide community for English-speaking Sisters to volunteer to come. And they came. The first four arrived in October 2001, and in January 2002 they opened two missions: Chepnyal and Thigio, small rural villages. Very soon other Sisters came from Ireland, England, Eritrea, the United States, Nigeria and Ethiopia. 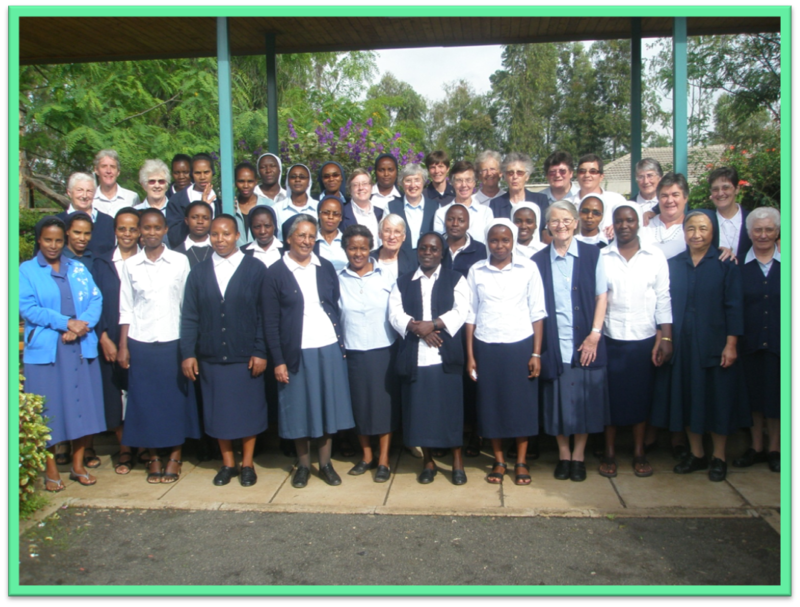 The vision from the beginning was to be where Sisters would serve the people most in need and to form young Kenyan women to become Daughters of Charity. Soon the greatest needs surfaced in both places: water, nursery education, programs for mentally and physically challenged children, women's development, access to healthcare, attention to the elderly, purposeful activities for youth...the list goes on. More Daughters arrived and four more missions opened: two in Nairobi (Central House and Formation House), Kitale and Kiio. The hand of God was certainly there each step of the way. More needs surfaced and more funding was essential, and more personnel was vital for the continuation of the D.C. mission in Kenya. It is now 2016, 14 years after the opening of the first two missions. The challenges grow every day: scarcity of food, jobs, water, and money for school fees, housing and healthcare. God continues to bless us in many ways. Ours is a world of singing, drums and dancing in church; donkeys and carts on the road; hard-working people in shambas (vegetable fields); very serious students whose grades determine their future education; extended families who live on the same compound; and people who live with trust in God. We are inspired by the vision of the Sisters in seeking financial assistance from funding sources, graced with volunteers who share their expertise, supported by hard-working staff and collaboration with many groups in and out of the country. We are now about 20 missionary Sisters working alongside 17 Kenyan Sisters. We know we are doing God's work and God is working with us and through us.